Recently, a group of researchers at Harvard University developed an innovative, anatomically designed device that could help rehabilitate patients suffering from ankle and foot disorders. Unlike traditional exoskeletons, which are rigid and restrict full range-of-motion, this prototype incorporates a unique combination of soft materials, sensors, pneumatic artificial muscles (PAMs), and control software to provide support and allow for natural movement. I recently spoke with Yong-Lae Park, the lead-author of the study, about the development of the device and the future implications of the research. Park, who is now an assistant professor in the Robotics Institute at Carnegie Mellon University, was in charge of the mechanical design, prototyping, and fabrication of the device. One of the major goals of the project was to improve upon the pre-existing technology found in exoskeletons. “There have been a lot of developments and research related to exoskeletons, but most of them use rigid frame structures to provide support,” Park told me. “While these are great for transmitting forces and defining joint motions, they limit existing degrees of freedom in our body.” Those limitations can lead to atrophy of certain muscles from disuse. The researchers aspired to provide active assistance and support without the use of frames, thereby promoting muscular rehabilitation rather than atrophy. To enable natural movements, the researchers first studied the anatomy of the foot and ankle. Park said that it was “impossible to copy all of the different muscles of our complicated biology,” in which any one motion is controlled by a complex network of different muscles, tendons, and ligaments. Instead, the researchers pinpointed four major muscle groups responsible for the primary motions of the ankle. “As an engineer, I tried to simplify those structures and identify some major muscles and principles,” Park explained. 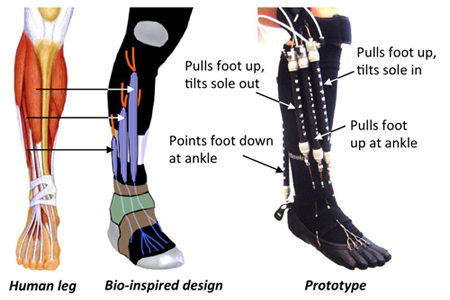 With the key muscle groups identified, the team designed the device to mimic the natural movements of the ankle. The anatomical approach helped the device achieve a sagittal motion of 27 degrees — sufficient for a normal walking gait. The researchers incorporated three different types of sensors in the device to monitor the positioning of the foot and ankle. These included inertial measurement units (IMUs), pressure sensors, and custom-built strain sensors. The strain sensors were positioned at the top and side of the ankle, while the pressure sensors were located on the bottom of the foot. The two IMUs were located on the lower leg and foot. Park described the strain sensors as “fully stretchable and compliant,” capable of conforming to complicated body shapes and detecting joint angle changes. They were made from elastomer sheeting that contained microchannels of liquid metal alloy. The sheets operated as an artificial skin, and any manipulation of the sheets caused a change in the electrical resistance of the alloy. Actuation for the device was provided by four commercial PAMs, which powered the artificial tendons of the device. The researchers also developed an electronic controller and software programs as part of an intelligent control system. The following video shows the PAMs and strain sensors at work. It also demonstrates the natural sagittal and mediolateral motions that the device enables. As with any prototype, the device needs further development to bring it closer to market. One issue that Park has already started addressing involves the PAMs. He mentioned that although the commercial PAMs provided sufficient force for the application, they were too big to use on a wearable device. As an alternative, Park has developed flat, strap-like actuators, which are less bulky than the commercial PAMs and much easier to conceal. He will present a paper on the actuators at the IEEE International Conference on Robotics and Automation (ICRA) in June 2014. Other aspects of the device that require improvement involve the sensory components. Park said that the actuation mainly depends on contact with the wearer’s skin, but the rubber padding that holds the PAMs on the skin is uncomfortable. He said that in future designs, he wants to make the device more skin-friendly and breathable. In addition, Park intends to improve the device’s ability to monitor muscle intention, since the device currently doesn’t detect how the user wants to move. Finally, Park mentioned that the device is limited by its lack of framing. With no frames integrated into the device, it is hard to transmit force to the body. While there is no official timeline for when a device could be ready for clinical trials, Park is optimistic about both the demand for this type of product and its manufacturability. Since this was a prototype, much of the device was custom-designed to fit its subject, but in the future, Park said that design for manufacturability will be “really important.” He believes that he will be able to utilize 3D printing to facilitate the production of certain components and streamline the overall manufacturing process. Unfortunately, the development of this device has been put on hold as Park looks for sponsorship. “As soon as I find a new funding source, I can restart,” he said. Park is also involved in developing a “wearable sensing suit” based on a similar sensory technology. He said the device will be able to measure the biomechanics of joints and monitor how you move during various activities, including exercise, sports, and even video games. The wearable suit will be especially relevant for physical therapy and sports training. The original research for the orthotic device was funded by Harvard University’s Wyss Institute for Biologically Inspired Engineering and The National Science Foundation. It was published in Bioinspiration and Biomimetics.